What first strikes you when you pick up Greg Rucka’s (Wonder Woman) and Leandro Fernández’s (Deadpool, The Discipline) creation is the title of the comic itself. 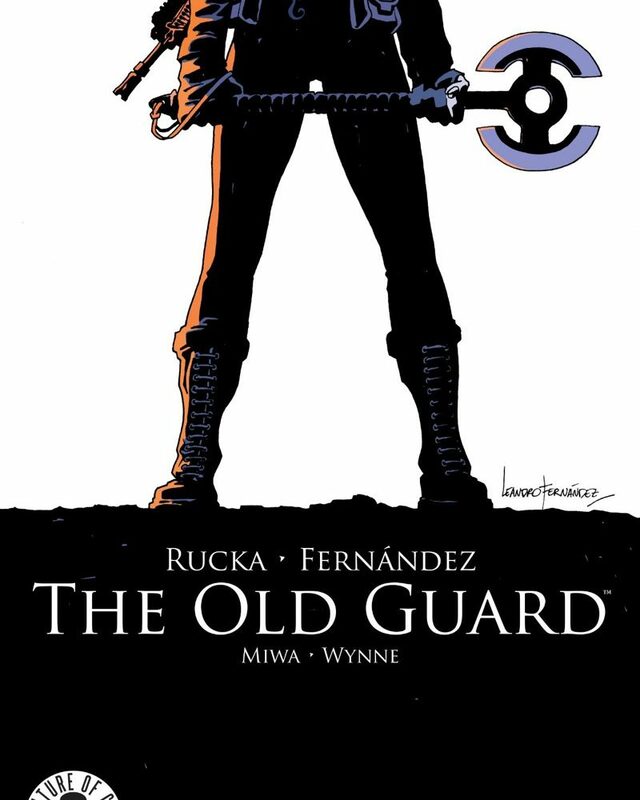 The Old Guard, from Image Comics, is a story of four veteran soldiers who cannot be killed. And so maybe it’s fitting that the masthead bears a term remembered as much for Napoleon’s finest troops as it is for those too stubborn to move on. This is, after all, a story of immortality, a dark insight into the lives of Andy and her team. The art and colour of the cover (Fernández and colourist Daniela Miwa) puts the needle to the record for the comic to come. Half-flame-red-half-ghost-blue, the striking image of a faceless woman yawns up like a shadow, a black-white finish perfect for a story of life and death. The opening quote is from Douglas MacArthur, decorated general of the U.S. Military: “Old soldiers never die, they just fade away.” It’s a gut-check for readers who think this will be a simple ride off into the sunset for our quartet of (anti) heroes. The opening narrative is evocative, a series of trade-offs of Andy in war versus her intimate experiences in the bedroom. Fernández gives us a wealth of battle images from theatres such as the Mediterranean, Persia and mainland Europe, the only consistency between them all a fine use of black, of a nothing-colour, to bring Rucka’s story to life. As Andy meets up with her team in Barcelona, the writing changes from subtle discussions of death to quips and one-liners between four old friends. It’s certainly a major strength of the comic, dialogue sounding right off the page, bubbles trailing through the artwork to speed the plot along nicely. But if the words are overshadowed by anything, it’s the clinical finish of Fernández, the critically acclaimed artist grounding us in a variety of locations-Barcelona, Paris, the Middle East-with as little as a single panel of well-flourished colours by Miwa. A side-step of the plot away from our main characters to a town in Afghanistan funnily provides some of the most memorable pages, a hunt for a local terrorist presented in a series of rapid-fire panels sure to leave readers impressed. Back with Andy and crew, we head to Sudan on a rescue mission, the stakes of their daring raid only as high as their asking price. It’s without a shadow of a doubt the moment of issue 1, a blend of red and blue images capturing the intensity of a fully-fledged firefight. And when the dust finally does settle, we’re left with unanswered questions…..
Kyle is a pharmacy graduate who spends most of his free time playing with words. A fan of sci-fi and fantasy, he runs a blog over on yourelisteningnow.com and is currently working on his first novel, Mist Rock (italics). In the past he wrote with the award-winning UCC Motley magazine and was nominated for the 2016 Colour Writer of the Year at the SMedia awards.